Christmas is my favorite time of year to decorate. wee trees all over the house add Holiday cheer. and lots of glistening gold ornaments and ribbons galore. I am feeling like adding more quiet decorations. Pearly whites, soft pale pinks, silvers & muted old golds. bits of berries and just a few ornaments. red in here- I do add a bit more color either way! and love how it changed the feeling of the bed. too cold and frosty for me, but I do enjoy the faux variety. are dusted with faux snow. Each year, my NOEL letters come out for a bit and sit atop the shelf. with a few touches of white. to sit near the commode that serves as my nightstand. It's a perfect spot to stack my latest reading. I love the red berry twig wreath tied to the back. for the bedroom that I have planned. and several pillows warm up our bed. and a wee dainty silver vintage inspired garland. Here is the mantel in our bedroom as it looks for the moment lol! have not been 100% happy yet- so it just might change again!! so the wreath continues the flocked look. 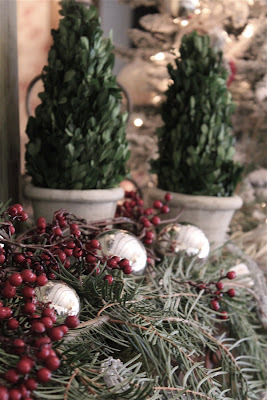 I laid a few fresh pine boughs atop some dried silvery leaves. bring the bling and color. and tall candelabras and it's finished. I bumped into something and broke a couple of the arms off of one. I can fix them with JB Weld- but it takes some time. So, for now these gray ones will have to do. I am off for a walk and then back to work on a few projects!! ...Faux snow is the best!! Oh, I love it! Everything looks so fresh and festive! Really nice images! 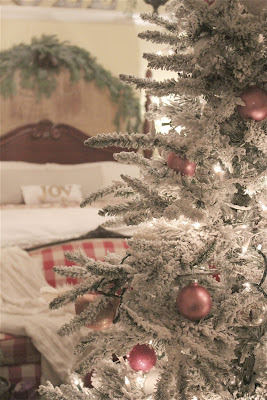 I'd never thought before of decorating my bedroom for Christmas! It looks so nice though! It looks FAB! Nice to see something so different from my own home, yet still so appealing! Your room looks amazing! So warm and cozy. Just beautiful! So tastefully done...very calming and peaceful. I LOVE the red checked settee. Courtney, your room is gorgeous all dressed for the holidays. That is my favorite settee, too. beautiful.....real tree and sprayed with fake snow? Gorgeous! 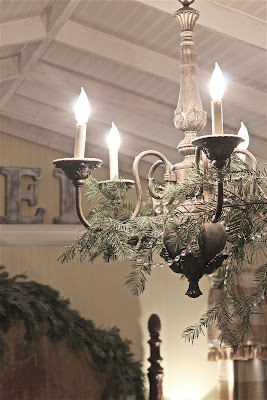 I love every single thing....and the peeks of your Christmas tree....beautiful! Your room looks absolutely stunning!! So beautiful!! Your bedroom is full of loveliness and charm. I love all of the architectural details. 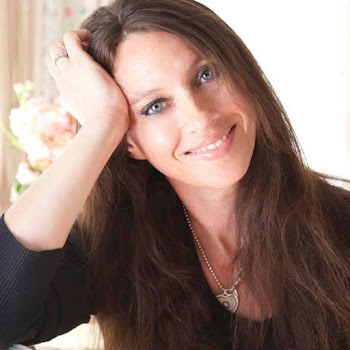 New to your blog, its beautiful!! Have a Merry Christmas! Courtney, this is sooo pretty! Everything looks so warm and cozy. Your bedroom is a true sanctuary! Thanks so much for sharing! I love it! It is all absolutely breathtaking! 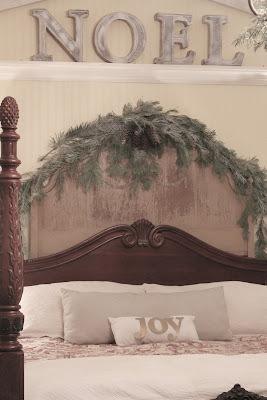 I love the greenery above your bed! So beautiful Courtney. 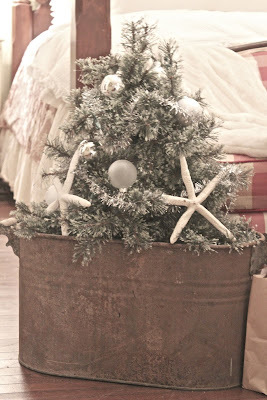 Looks straight out of a Country shabby chic Holiday magazine. Gorgeous home and Christmas decorations! Your home looks so pretty! I love the way you have decorated your room-the muted colours and natural look is gorgeous! Hope you had a nice walk. I can't wait to see your other decorations! Courtney, this is just lovely. Your decor is just gorgeous. That fireplace is fabulous!! Love seeing all you have done for the Christmas season. Oh, I'm SOOO envious!! You have THE perfect bedroom. Ours is so tiny. I MUST find a way to make it look like this. Sigh. Beautiful ! ! ! Thank you for sharing. Hope you & your family have all the blessings of Christmas. 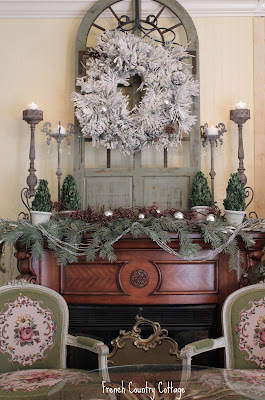 Love the NOEL letters and how you have dressed the mantel. leave it alone...orders from me!!!! I feel the same way as Laurie at Heaven's walk. I must save this somehow for ideas for next year. 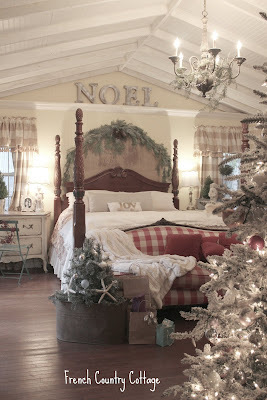 That bedroom looks so enticing and perfect for a place to dream of Christmas. I love all your live boughs and your tin buckets. 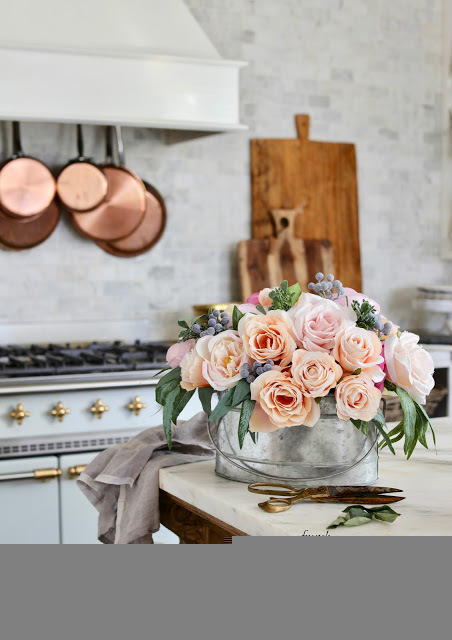 Everything is modern and clean yet vintage and charming at the same time. Absolutely lovely! Oh my GOSH... that bedroom!!!! 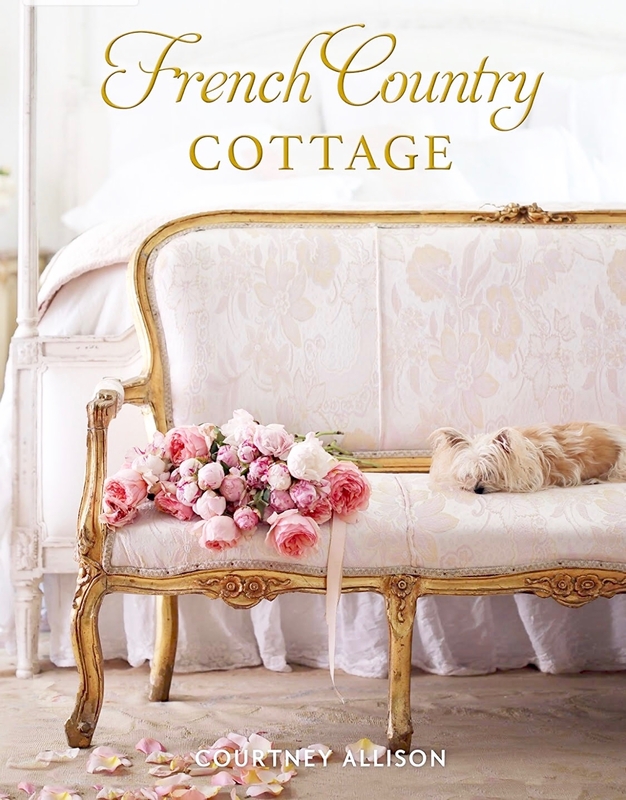 I'm so with Cottage By the Sea... modern, clean, vintage, charming, yes yes yes! The green snowy boughs offer such a dreamy atmosphere... gorgeous! Hi, your pictures always look so good! How do you get them to have the clear white silvery look? I don't know what to call it?Do you know what I mean? Beautiful, warm, cozy, and inviting. Love it Courtney. I like the mantel the way it is, but I'm the same way with constant change. So pretty, soft and cozy. Absolutely beautiful! It's so romantic, yet clean and simple. You give me so much inspiration! Your bedroom is sooo gorgeous, Courtney! I love the greenery over the bed and the little tree in the bucket, and of course, I think I say this everytime...the ceiling! 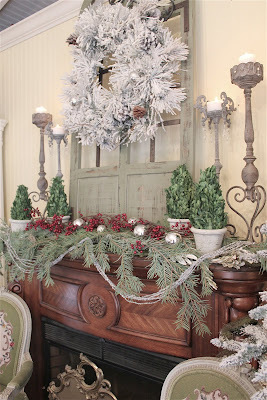 Courtney I adore your mantle just the way it is!! I know what you mean though I am always finessing mine! 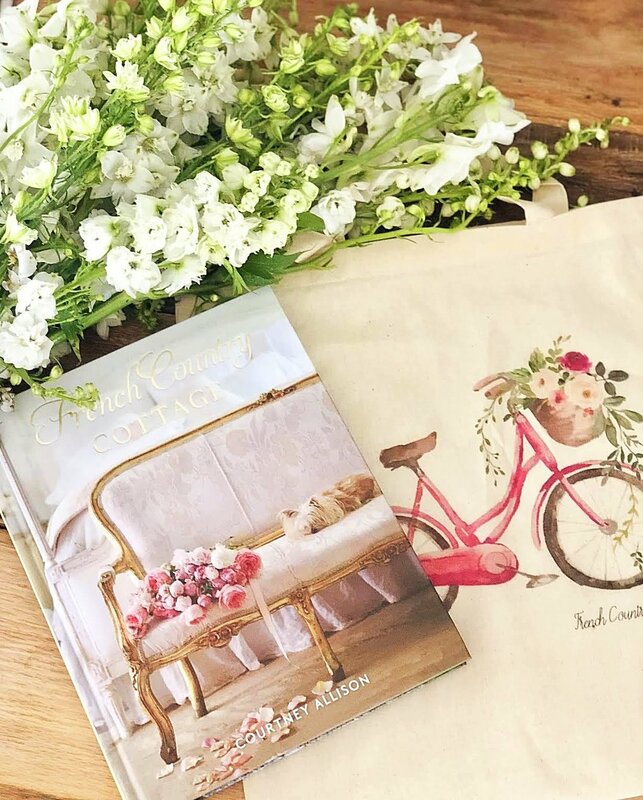 Come to enter the latest Giveaway from Design du Monde! It is a Framed Antique Architectural Print! Oh my Sharon......Your house is simply magnificent. I just sigh when I look at these pics... so beautiful! 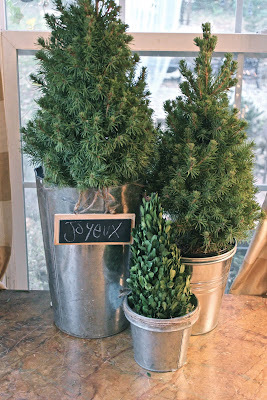 I love the mini trees with the chalkboard. Thanks for sharing. I'm inspired! :) Merry Christmas! Going back to pin a few...and maybe to take a walk, sounds like a good idea! You are an inspiration....so much beauty in your life. I like the zinc with greenery, the red wreath and all the natural elements. The greenery around your home is gorgeous. It is one of my favorite decorating supplies for Christmas. So beautiful! 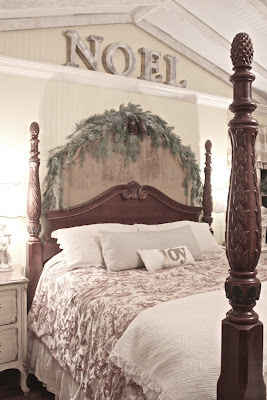 Gorgeous...Love extending Christmas decor into the bedroom. Thanks for the inspiration. How have I never seen your bedroom before? Thank you for linking up and wishing you a wonderful rest of your week! Amazing! I always love your stuff. I love your bedroom. Looks like right out of a magazine. Might have to change my duvet to red and white. The settee is so you. Such Christmas beauty to love over here. Love all that you have styled in your bedroom. Courtney, this is incredibly beautiful! Absolutely stunning. Beautiful Christmasy country French Bedroom. I love it! What can I say but Swoon!! Swoon...yep that's what I just did! So gorgeous Courtney...magazine worthy! Thank you for sharing at my party Courtney...ove all the little trees. Thank you, Courtney, for linking your stunning bedroom post to Potpourri Friday at 2805! gorgeous! I love the way you said "quiet decorations" that is perfect and definitely what I am feeling this year. It's beautiful Courtney! Have a very Merry Christmas! Thank you for joining me at Home Sweet Home! Your bedroom is gorgeous! 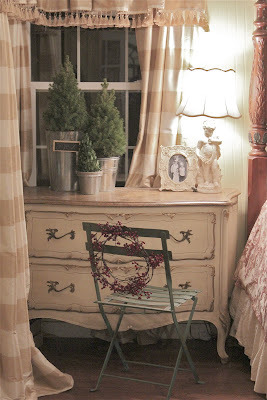 Love the old headboard behind the headboard and the bistro chair! Hi Courtney! Your bedroom is drop dead GORGEOUS! 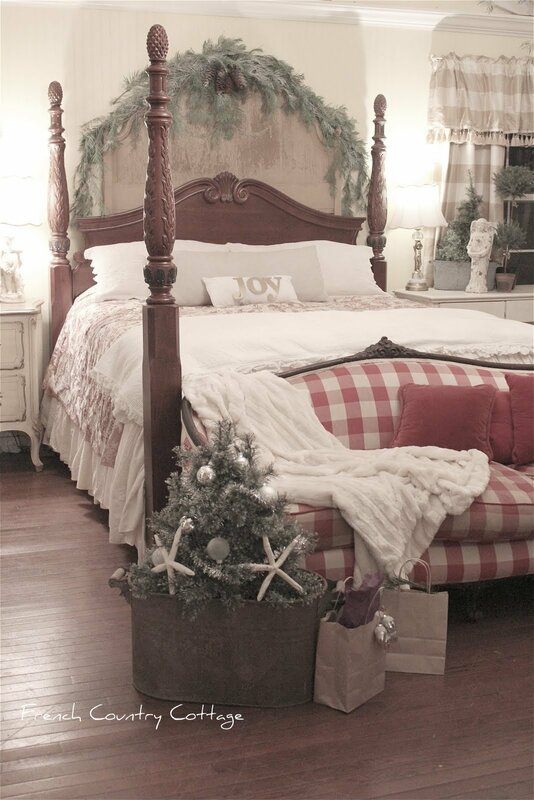 I can't begin to tell you how much I love this room decorated for Christmas. I hope you have a wonderful Holiday. Gorgeous, I would never leave that room. Is that a headboard behind you headboard? How did you do that? WOWOWOWOWOWOWOW!!!!!!!!!!!!!!! Love it! Pinning it! Do you know the name of the red checked fabric that the sofa is covered in and where I could find it? Is there anyway the lady that decorated this room could email me???? I have multiple questions as far as where she purchased things. I am moving into my first home and love this idea as far as decorating. If you could plese email me at ENigh22@gmail.com. I really would appreciate your time. the 'rusty galvanized tin" is a copper boiler. It never gets old! Every time I look at this post I fall in love with the room and decorations all over again! Merry Christmas in July!